OPI, the company who has been around since 1981, is the gold standard in nail polishes. 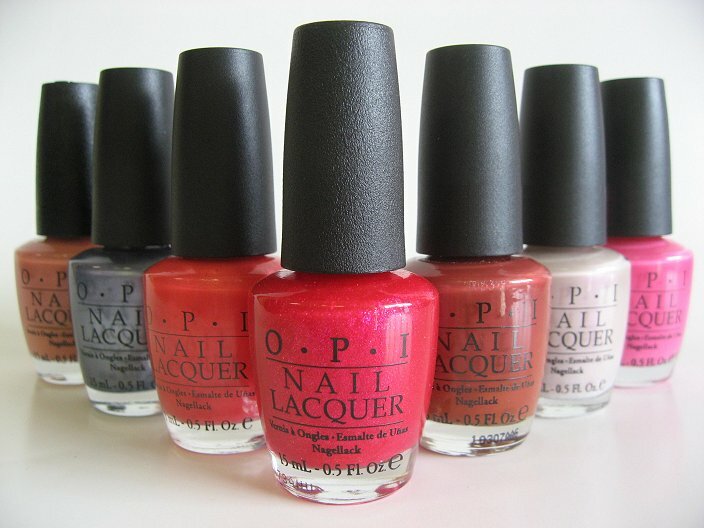 Year after year, OPI releases new collections to their ever-growing list. Of course they can’t just keep manufacturing hundreds (if not thousands) of different nail polishes, so each one eventually goes by the wayside – DISCONTINUED OPI! So don’t get too attached to your new favorite OPI nail polish, because one day you won’t be able to find it any more. If you’ve been looking for information about an old favorite of yours, then you are in the right place. Here’s a comprehensive list of discontinued OPI nail polishes, sorted by year and collection. With names and numbers. Most of these are completely gone. You’ll never find them ever again, but on the other hand, many can still be found. Browse through nail polish history and let us know if you see any missing colors. Enjoy! and a cute Polar Bear! HR F02 – Kiss Me-Or Elf! HR F09 – What’s Your Point-settia? SR FA4 – Good Grief! SR FA5 – Where’s My Blanket? SR FA6 – WHO ARE YOU CALLING BOSSY?!? NL N39 – Going My Way or Norway? NL N48 – Thank Glogg it’s Friday! NL N47 – Do You Have This Color in Stock-holm? NL N44 – How Great is Your Dane? NL C33 – Orange You Stylish! NL BB3 – Orange You Going to the Game? NL N34 – You are So Outta Lime! NL N01 – Put a Coat On! NL A63 – OPI Scores a Goal! NL A66 – Where Did Suzi’s Man-go? NL G38 – I Reached My Gold! NL F63 – Embarca-Dare Ya! NL T62 – What Wizardry is This? NL T60 – Which is Witch? NL E77 – Hands Off My Kielbasa! NL E76 – My Paprika Is Hotter Thank Yours! NL E78 – Oy – Another Polish Joke! NL E73 – Suzi’s Hungary Again! NL E80 – Vant to Bite My Neck? NL G15 – Deutsch You Want Me Baby? NL G21 – Nein! Nein! Nein! OK Fine! NL G22 – Schnapps Out of It! NL T23 – Are We There Yet? NL T14 – Do You Think I’m Tex-y? NL T20 – Y’all Come Back Ya Hear? Show It & Glow It! NL B77 – Feelin’ Hot-Hot-Hot! NL B76 – OPI On Collin Ave.
NL I47 – Yoga-Ta Get This Blue! I Get A Kick Out of Gold! NL M21 – My Chihuahua Bites! NL M26 – Tijuana Dance? NL M32 – Will You Mari-achi Me? NL M24 – You Rock-apulco Red! O’Hare & Nails Look Great! That’s An “EL” of a Color! It’s A Bird, It’s A Plane, It’s OPI! NL C84 – Don’t Wine… Yukon Do It! NL C81 – Nice Color, Eh? NL G09 – Calling All Goddesses! NL G11 – Don’t Socra-Tease Me! NL B11 – Friar, Friar, Pants on Fire! NL B15 – Lighten Up, You’re Two Pence! NL V04 – 3 Plums, I Win! MMM… Vould You Like A Likc-Tenstein? NL A12 – Chile o Caliente? NL I30 – Hey Vito, Is My Car Red-Y? NL I31 – Your Villa or Mine? NL N32 – Orange You From New York? NL H12 – Heeere’s Tawny! NL W01 – Howdy, Heeey!